PHARR — The public entity charged with constructing a multi-million-dollar loop in Hidalgo County will continue to work with Dannenbaum Engineering Corp. — despite an apparent federal investigation into the firm’s dealings. Board members for the Hidalgo County Regional Mobility Authority (HCRMA) met Monday morning at the Pharr Memorial Library for a special-called meeting. 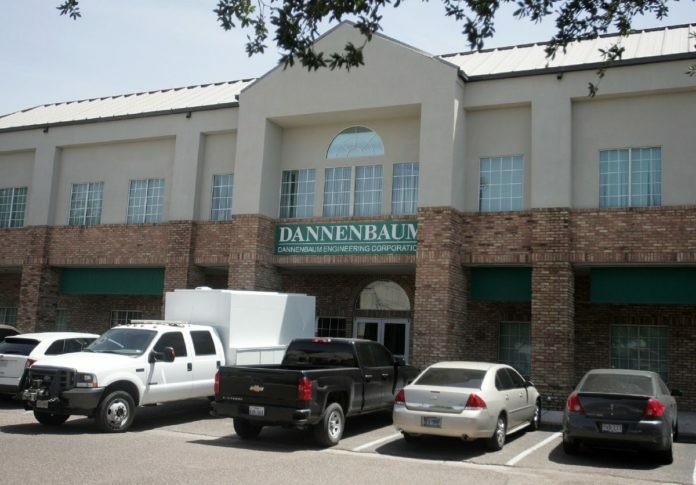 The gathering marked the first time board members sat together to discuss business with Dannenbaum since FBI agents raided the firm’s McAllen office last week. The Houston-based firm is under a five-year contract to serve as the program manager for two multi-million dollar roadway projects. The management work comes with an $8 million price tag. Before the meeting began, an attorney and a representative for Dannenbaum took to the podium to ask the board to continue to work with the team on the ongoing projects. Dannenbaum attorney Robert Guerra said there were “erroneous” reports from the media that stemmed from the raids and emphasized the firm continued to cooperate with federal authorities. In fact, he said, the firm had been in contact with the FBI for weeks and would have “voluntarily produced all of the seized records” had agents asked. Among the records seized, was a server that contained all of the project documents for the HCRMA, which triggered a 24-hour delay for staff trying to access documents. Consultants from 15 different teams and eight HCRMA staff members rely on Dannenbaum to keep project-related files — such as engineering plans and analyses — under their purview, while HCRMA houses government-related records, a part-time CFO oversees financials, and the city of Pharr handles the preparation of the financials and bookkeeping. “When the government improperly confiscated an HCRMA server from our offices, Dannenbaum Engineering immediately recovered the data and our work on the HCRMA project was practically uninterrupted,” said Guerra, the firm’s attorney. He also argued that Dannenbaum has achieved goals others have tried but couldn’t accomplish. “The previous board and consultants were not able to successfully complete a financeable project or create a successful project development strategy,” Guerra said. Rodriguez offered some background after the meeting. Initially the HCRMA was under the command of a group called the Hidalgo County Road Builders, comprised of a consortium of consultants. That group tried to design, finance and construct the loop in one major project versus the segmented approach taken today. “It was a different kind of business model, and that’s the project that didn’t really get any traction because the market went belly up in 2008 and 2009, and they weren’t able to finance it,” Rodriguez said. The first group never turned any dirt and soon after Dannenbaum was hired to take over. Under new direction, the HCRMA obtained environmental clearance and right-of-way acquisitions. The entities broke ground last year on a portion of the project that will connect the Pharr International Bridge with the loop, referred to as the 365 Tollway. The tollway seeks to give commercial and private drivers an alternative route across the Rio Grande Valley that will connect international ports of entry to foreign trade zones and other industrial parks. HCRMA is also on the verge of starting the bidding process for the actual construction of the tollway, he added. He suspects the process will begin in about 90 days. “For these reasons, the HCRMA has trusted our company and we are asking that you stick with us now as we work to resolve the evolving matter with the federal government,” Guerra concluded. Afterward, board members went into executive session — where they discussed “legal issues pertaining to professional service agreements” — before coming back out about 30 minutes later. They did not take action on the item. The contract with the firm, however, is set to expire next year.